Wedding Cake Topper 8.75"H, Wt. 10 oz, Resin and Stone mix. Rhinestones, fabric tulle veil. Oval Base - 2.75" x 4.375"
The gorgeous wedding gown features an engraved literary caption "Now join your hands and with your hands your hearts." 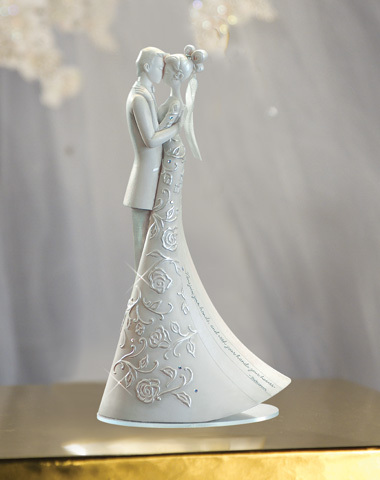 - Shakespeare - The First Dance Wedding Cake Topper is also a stand-alone collectible and as an added value to customers, the collectible size 'Language of Love' Cake Toppers purchased here are hand signed by Gina Freehill. If you are looking for a cake topper that has both a traditional and modern feel The First Dance wedding cake topper will be the perfect choice!